The Great Bear Foundation had the good fortune to spend some time at McNeil River State Game Sanctuary in Alaska last June. Dr. Frank Tyro, a longtime GBF field course instructor, put together some great video of our trip. The sanctuary boasts the largest population of brown bears in the world, thanks to abundant salmon runs, rich, protected habitat lacking human development, and strict management that allows for only 10 human visitors at a time during the salmon season. The strict, consistent management of the site for the last four decades has helped to ensure relatively safe, high quality bear-viewing opportunities with minimal impact on the bears. This is not always the case in bear-viewing. Bears, by nature, are incredibly tolerant animals. Because they are equipped to do a lot of damage to one another if the need arises, they normally avoid conflict with each other in order to minimize the risk of injury. When a food source is abundant, bears often mute their responses to one another, allowing large numbers of bears to feed in the same area without bothering each other too much. This is known as bear-to-bear habituation: a neutral response between bears that allows them to take advantage of rich food supplies. Certain circumstances allow bears to habituate to humans, as well. When human behavior is managed properly, and humans provide neither a threat nor a reward, such as picnic baskets, to the animal, over time, bear-to-human habituation may occur. This means that the bears show a neutral response to humans as well, going about their normal business, feeding on salmon or berries or sedges, without paying much attention to human activity. The bear certainly knows the humans are there, but since they offer neither food nor threat, the bear may very well ignore the humans. This bear-to-human habituation is partly the result of careful management of human behavior, and it allows for incredible opportunities to observe bears behaving naturally in their own habitat. 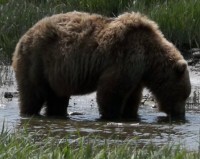 Alaska and Canada are home to several sites that are managed for safe, low-impact bear-viewing, like McNeil River, Anan Creek, Pack Creek, and Gribble Island. However, there are more numerous places where people go to view bears that are not as safe–for bears or humans. These are places where bears abound, but where human behavior is not carefully managed. Bears raid coolers, backpacks, tackle boxes, and in extreme cases, even tents and campers. Human behavior is not managed, so people get too close to bears, pushing their limits for that close-up photo or ridiculous Youtube video. Humans are not behaving in a predictable manner, so bears don’t always know what to make of us, or what to expect. The results are dangerous and detrimental–but it’s usually the bears that suffer. On salmon streams across Alaska and western Canada, bears die each year because of this human carelessness. Some become too accustomed to close encounters with humans, and push their boundaries until they wind up getting killed by a member of the public, or euthanized by bear managers because their behavior has become dangerous. Sometimes the bear is not even behaving aggressively, but a human with a gun misinterprets the bear’s nonchalant approach as an act of aggression. Some bears lose their fear of roads, and get hit by cars. Young bears, on their own for their first season, find it easier to obtain food from humans and wind up in risky situations. These bears are the future of the population, and they are at the greatest risk. >>Know the situation. Is the area managed for bear-viewing, or is it a multiple-use site? Bears will react differently to humans in a remote, designated bear-viewing area than they will at a high-traffic sportfishing stream. Learn about the management and history of the site, so you’ll know what level of risk to expect. Talk to rangers, naturalists or law enforcement officers to find out your risk and how best to behave. >>Keep your distance. Bears often deal with stress by ignoring the stressor, to avoid conflict. A bear may appear to ignore you, but your approach is likely causing an elevated heartrate and a release of stress hormones. These very real physical responses are not outwardly detectable, but they result in energy loss, decreasing that bear’s likelihood of surviving the winter or reproducing. Female bears cannot reproduce if they don’t have enough body weight going into hibernation. Keep approaching the bear, and that muted response may not stay muted–pushing the limits can result in an otherwise-tolerant bear charging you. >>Be aware of other humans around you. People often lose their cool around bears. They get excited about their photographs and take personal risks that put everyone else in danger. Looking through the lens of a camera, people lose sight of how close they are. In groups, individuals creep incrementally closer, until what was a group photographing a bear at a respectful distance becomes a group closing in on a bear. Other people will put you in danger. Just because the “professional photographer” with the big lens is getting closer doesn’t make it safe–for you OR the bear. >>Allow the bear an exit route. Salmon streams and national parks allow for easy bear-viewing opportunities. However, once people start crowding around, a bear can quickly become surrounded. If the bear wants to leave, it has no choice but to approach humans or bust through a crowd. Most bears don’t want to take that risk, so they stay in place, displacing nervous energy into acts like grazing, that are easily misinterpreted by humans as contentment. If the bear wants to leave, let it leave. Do not follow or approach a bear. >>Use a telephoto lens. Telephoto lenses allow photographers to get close-up shots without badly impacting the bear. If you don’t have a telephoto lens, adjust your aesthetic. Take a photo that shows off the bear’s natural habitat. A shot of a bear in its habitat tells a much more interesting and compelling story than a close-up. >>Carry bear spray. And, know how to use it. Recent studies show bear spray as nearly twice as effective as a gun, in terms of escaping a dangerous encounter without significant injury. Bear spray is legal, inexpensive, lightweight, and easy to use. Accidental deployment of bear spray will make everyone uncomfortable for a while, but it won’t kill anyone like an accident with a gun might. Bear spray saves human lives, but even more often, it saves the lives of bears. >>Learn about bear communication and behavior. A little reading, common sense, and attention can go a long way to prevent conflicts with bears. Using your senses and understanding common bear behaviors will empower you to better understand what’s going on from the bear’s point of view, so you can behave accordingly. Look for signs of stress, like increased vigilance, yawning, or nervous behavior, and look for warning signs, like huffing, jaw-popping, and salivation. The bear may be stressed by humans, or it may be stressed by the presence of another bear (that you may not yet know about), but either way, you should back off and give that bear some room. >>Never allow a bear to get a food or other reward from you. Bears are opportunistic omnivores, and they learn quickly about new food sources. It just takes one cooler, one stringer of salmon, or one backpack to teach a bear the bad habit of seeking food from humans and their trappings. This may seem cute or funny to the inexperienced bear-viewer, but it will most likely result in the death of the bear when it goes a step further and starts seeking out human food, and it will be your fault. Non-food rewards, like rubber tires, fishing gear, or plastic water bottles can easily become play-things for bears, and this kind of reward is also dangerous to the bears. If it belongs to a human, don’t let a bear get to it, even if it results in cute or funny photos. Most things that bears do that make us laugh wind up getting bears killed. The Great Bear Foundation offers field courses each year to view bears safely, with minimal impact on the bears and their habitat. Visit our field course page for more information. Contact us to learn more about safety in bear country.